One can make many things out of a peanut and perhaps that is why there exist public expressions of appreciation for the peanut. Ashburn, Georgia made a sculpture of one and named it “The World’s Largest Peanut”. The phenomenon is surrounded by floodlights, wreathed with a crown tipped with bicycle reflectors and is visible from the interstate. Shortly after Ashburn put up its homage to the peanut, former President Jimmy Carter’s hometown of Plains, Georgia installed a monument of its own. The “Second Largest Peanut” has become a tourist destination of sorts in Plains. Because the Plains peanut was constructed primarily of styrofoam, some early visitors to the nut’s memorial found themselves irresistably drawn by the temptation to take home a souvenir piece. A protective fence has been installed around it. Most of the peanuts grown in America are eaten. Peanuts–boiled, roasted, chopped, or made into a paste–appear in just about every regional form of American cooking. Still, it is fair to say that the peanut’s place in the food of the South is especially prominent. Southern cooks have, for many years, shown a fine respect for the many ways one may use a peanut to make good foods, both sweet and savoury. 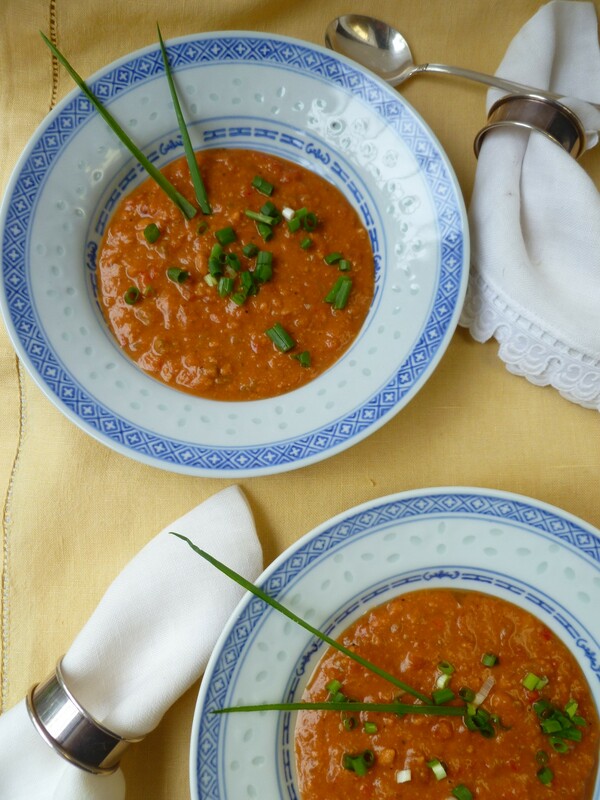 Sweet Potato Peanut Soup is one of those ways. It is a soup of many agreeable flavours, but the peanut is the source of its special character. Eating goober peas in the form of Sweet Potato Peanut Soup, is, just as the song says, delicious. 1 can of Canned Sweet Potato Purée (between 14 and 16 ounces or 400 – 500 grams) or about 2 cups of puréed Sweet Potato from 2 or 3 fresh, roasted Sweet Potatoes: Canned Sweet Potato is not as dry as the purée of fresh Sweet Potatoes. Whichever is used, you can adjust the amount of bouillon or cream in the finished to soup to allow for this distinction. 1 can of Tomatoes, chopped up and the Reserved Juice: Can sizes differ. One of approximately 14 – 16 ounces (or 400 – 500 grams) will be the right amount. 3 cups of Water and 1 Vegetable Bouillon cube: Knorr’s brand is very good. 1/4 cup, plus 1/8 cup of Peanut Butter: Smooth or Crunchy Peanut Butter is fine. Crunchy Peanut Butter was used in the soup in the photos. 1/2 cup of Heavy Cream: One may add a little more to thin the soup if it is made in advance–which usually causes the soup to thicken…or if you wish to include a few more guests at the table. a Suggested Garnish: Sprinkle the soup with chopped Green Onion; slice the green parts of some Green Onions lengthwise into thin, straight spears and place a couple of them in a V-shape on the top of each bowl of soup. 1. Heat the oil in the casserole over medium heat. Add the onion, peppers and ginger and cook for about 5 minutes, stirring them about until the onion and peppers are tender. Add the garlic and continue to cook, stirring, until the onion just begins to turn golden. 2. Add the salt, black pepper and cayenne. 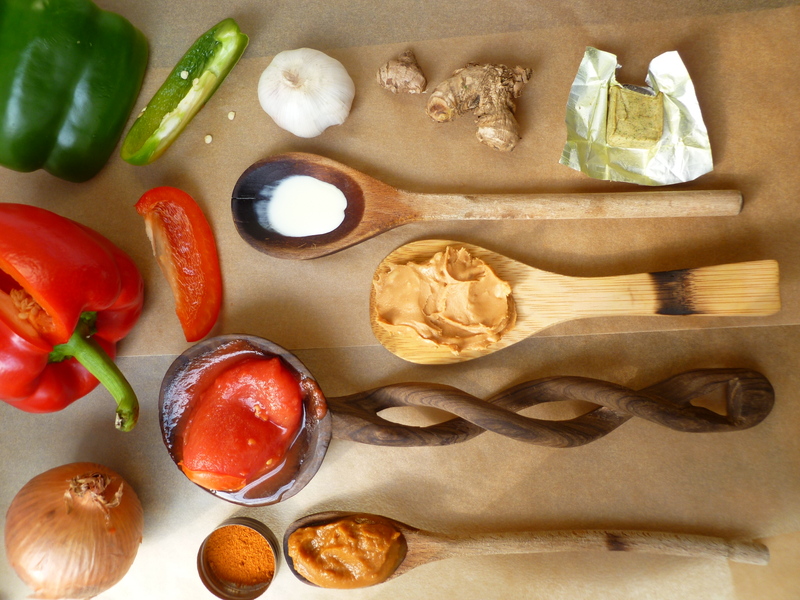 Stir everything around together. 3. Add the tomatoes and their juice, the sweet potato purée, water and the bouillon cube. Lower the heat and simmer the soup ingredients gently, covered, for about 25 minutes. 4. Add the peanut butter. Stir it in until it is completely combined with the rest of the soup ingredients. 5. Purée the mixture, a cup or two at a time, in a food processor or blender. The end result need not be perfectly smooth. 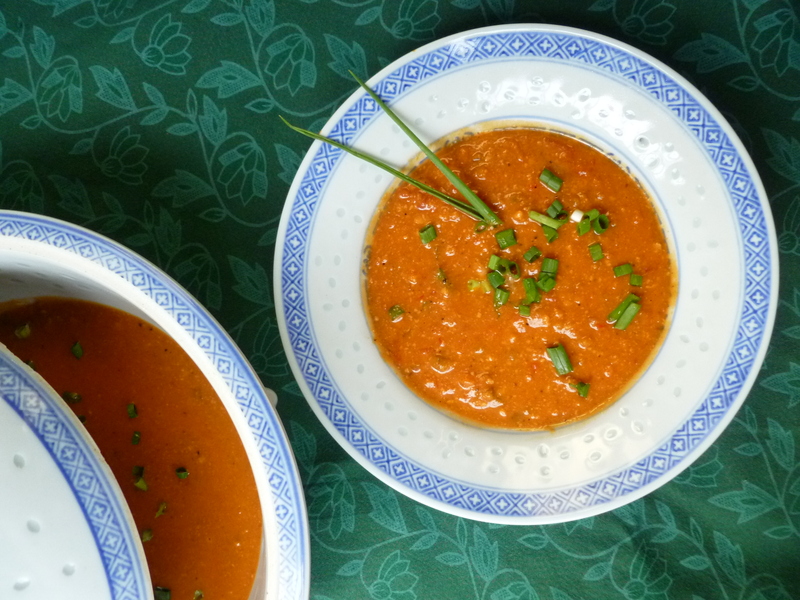 If you prefer a textured soup, either don’t puree all of it or puree all of it to a lesser degree. (The soup purée in the photos is textured; it was all processed, but not until it became completely smooth.) Return each puréed portion to the casserole. 6. Add the cream. The soup may be made 1 or 2 days in advance up to this point. Reheat the soup before serving and add a little more cream or water if it is thicker than you like it. Note: This is a thick soup by nature and is not meant to be served in large quantities in a dinner or lunch of multiple courses. 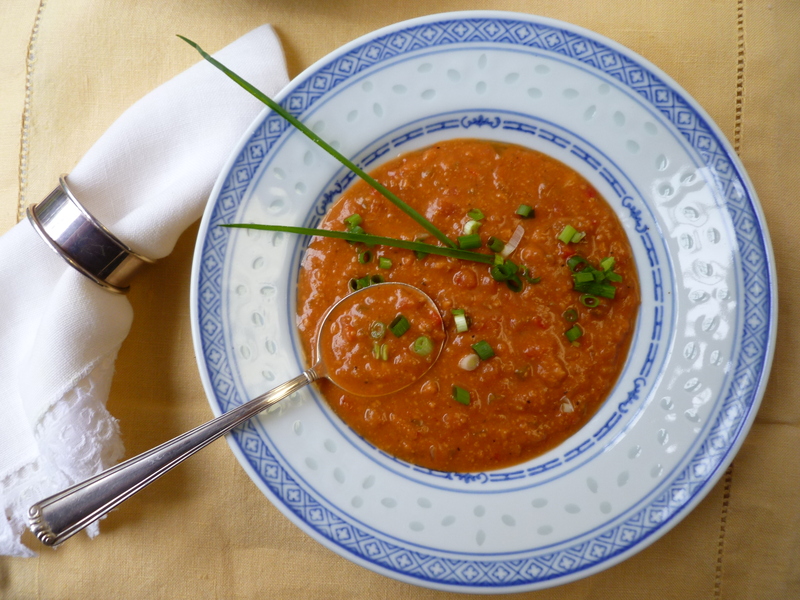 But because it is a rich soup, it is also very good as a Main Course for a Light Lunch. 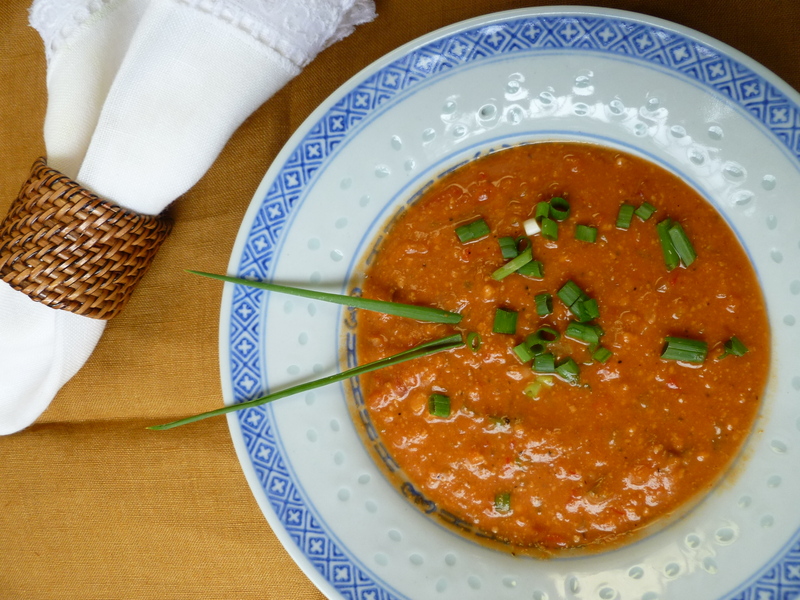 A Note: Sweet Potato Peanut Soup is the First Course of the Dinner Menu: A Lowcountry Dinner. This recipe is adapted from one in Deborah Madison’s cookbook This Can’t Be Tofu! (2000), and…doesn’t include tofu. Deborah Madison’s cooking is full of interesting and good combinations of ingredients and reflects her interests in seasonal and local eating, farmers markets and small farming. Another Note: A few portions of Andrew F. Smith’s book Peanuts: The Illustrious History of the Goober Pea may be read here online at Google books. Mr. Smith’s style of writing on food-related topics is entertaining and fun to read and what he has to say on the subject of the peanut is no exception. The texannewyorker food blog has included this soup in a listing of recipes for Thanksgiving on her site.